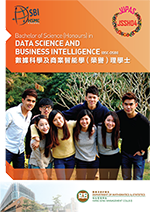 build up students’ ability to understand the importance of the applications of Data Science and Business Intelligence in their daily life, particularly in commercial areas. integrate and apply the knowledge appropriately in Data Science and Business Intelligence for solving practical problems in a dynamic business environment. To be a reputable programme, recognized for excellence in nurturing talents in the areas of data science and business intelligence. To strive for quality education and practical training in the areas of data science and business intelligence. To foster the all-round development of students through our diverse curriculum and various internships. Please visit Registry for admission details.